Breakfast might seriously be my favorite meal of the day. I love eggs, cereal, oatmeal, crepes, omelettes, blintzes..pancakes...waffles.........and I'm salivating. Breakfast has an endless options and one of the great ones is the almighty breakfast sandwich! Sometimes there is nothing better than hearty, toasted bread holding together savory breakfast goodness. This is a super simple breakfast sandwich - use it as a springboard for ideas to make your own, using what you already have! For me, it's all about texture, so I start with a base of creamy avocado, mixed with lime, cilantro, red onion, salt and pepper, and red pepper flakes. 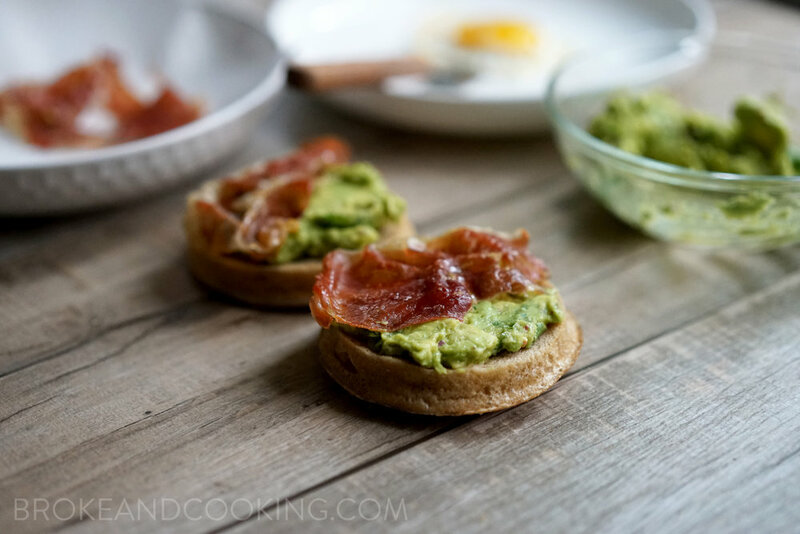 Add pan-crisped slices of salty prosciutto, and top it off with a nice, runny egg for the perfect breakfast combination. If you've never had crispy prosciutto, go, now! Baking or gently pan-frying tender, delicate pieces of prosciutto transforms the already delicious treat into intensely flavorful, crisp pieces of heaven. You can add pieces to a salad, toss them in pasta, or eat them like chips like I do ;) Let's get cookin! Ingredients for a simple and delicious breakfast sandwich! Smash 1 avocado with fresh squeezed lime juice, salt, pepper, red pepper flakes, and diced red onion. Add red pepper flakes if you'd like! Pop your bread or muffin into the toaster while you heat up a non-stick skillet over medium heat. Remove the crisped prosciutto from the pan once it has some nice color to it. Using the same pan (don't clean it! FLAVOR), add a small drizzle of extra virgin olive oil over medium-high heat. Fry an egg. If you've tried any recipes from Broke and Cooking, let me know! Comments, tags, and pix are so welcomed :) Find me on IG @brokeandcooking / #brokeandcooking! Hope you have a great week!